Great Britain's Harry Tanfield crosses the finish line in the Men's Time Trial. HARRY Tanfield had never ridden a time trial in the wet before but after a strong showing at the European Championships, the Great Ayton cyclist was not keen to throw in the towel. The 23-year-old rode down the starting ramp in Glasgow in dry conditions but ended it with ‘hailstone-esque’ rain barraging its way down, making the roads of the city treacherous. As one of the first to compete, it could have been far worse but Tanfield still made his mark, eventually finishing 16th in a time of 55:53.71, two minutes down on champion Victor Campenaerts. 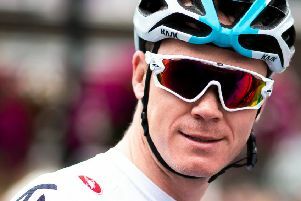 “When I turned on the TV to watch the start of the women’s time trial (earlier in the day), I couldn’t believe it because it was pouring with rain,” he said. “We were only 10 minutes away from the start and it was bone dry where we were. “I’ve never done a time trial in the rain before and luckily it dried out before the start of our race. I was over-cautious going through the town. “Later I felt the rain specks on my eyes and they felt like hailstones.